Conquering colder water swimming. No, I am not mad, I’ve just decided to make a success of this cold water business. So I’m four full weeks into the challenge to keep on swimming outside as long as I’m enjoying it. I’ve I have swum under the London sky 14 times since 23 September. The experience has changed massively. 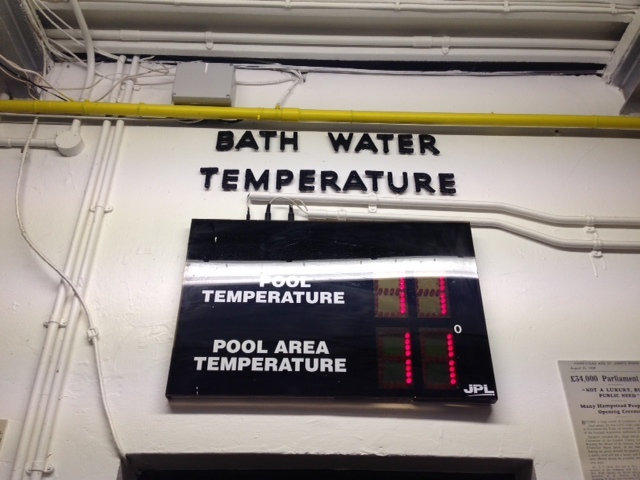 When I started the water temperature at the lido was 14’C and now it’s hovering around 11-12’C. In wetsuit wearing days I thought there was a big gap between 15′ and 16’C, now I know there’s a chasm between 14′ and 11’C. But hey, it’s fine, and I’m now almost feeling like a bit of a pro. I’ve come across some words of wisdom from the team at H2Open Magazine who say ‘plunging into cold water can give you an endorphin rush that can set you up nicely for the day’. Couldn’t agree more. Approaching the water I know it’s all about thinking positive. I don’t have the words ‘ooooh it’s going to be freezing’ anywhere near my head, instead I firmly plant ‘I CAN do this, I LOVE doing this’ in there instead. For some reason one Friday I had Shirley Hughes’s words from her picture book about opposites ‘bathwater’s hot, seawater’s cold’ in my mind, I think the temperature gauge must have set me off, so I added another phrase ‘lido water’s not’. I wade around in the shallow end, put my hat and goggles on, take my goggles off again and unsteam them, and then park all issues and problems and thoughts poolside and just get going. I pick a mantra to chant, perhaps ‘This Is Amazing’ or count stroke sets ‘1, 2, 3, 4’, until I reach the end of the first length. It’s all about getting through that transition phase from poolside to underwater at the end of the first length. By then it’s not remotely uncomfortable. I know if I stick at it, chipping away stroke by stroke, I’ll be fine. I stay in til I’ve done 1.32k = 22 lengths and completed my mission of the moment. It’s not a long way but this isn’t about distance, more mind over matter and gritty determination. I think success so far has been all about choosing the right attitude. I once watched an amazing motivational video called Fish Philosophy about fishmongers in an American market, who could track their sales down to the experience they gave all of their customers. They knew if they chose to smile, crack a joke, juggle with a fish, and entertain their customers and possible customers they’d succeed in selling more fish to more people. It all boils down to you and the choice you make. So if I want this challenge of mine to work I’ve got to borrow their can do attitude and choose to make it work. I can’t give up. I’ve embarked on this challenge and I’m not quitting! < Previous Wearing the wrong trousers home from secondary school, nagging and lost property: a year 7 parent’s over parenting conundrum.